This fantastic price gives you great value, and the freedom to travel on any date that suits you. When booking online, choose the date for your Game of Thrones Filming Locations Tour and then simply use your Belfast City Sightseeing tour ticket on any other day during your stay. *Please note National Trust members can cross the bridge and enter the Giant’s Causeway visitor centre free. Please choose our basic package and tell your guide on the morning of your tour. You can even split up the two days of your Belfast City Sightseeing tour ticket either side of your Game of Thrones Tour. *Subject to numbers. Please note, if you choose our basic package combo tour bridge crossing cannot be guaranteed. This is the 'real' Game of Thrones experience, don't miss out, book online now! For more information about the Belfast City Sightseeing Tour please click here. Series six saw Carnlough harbour feature for the first time. This harbour although built in the nineteenth century during the famine years, still retains an olde world charm, which meant that it didn't seem out of place when it first appeared in Game of Thrones. Few go swimming in the harbour today, but there was a time when "a girl just might"! This area has many strong links with the series! It is a stunning coastal location with incredibly rugged yet beautiful geological features! What happened in these Cushendun caves took many committed fans by surprise. Melisandre's shadow baby was born here and for a while this area was very "dark and full of terrors"
Guaranteed entrance to the Visitor Centre! The Giant’s Causeway is Northern Ireland's very own "Eighth Wonder of the World." No eloquent description will ever do it justice! Only seeing it is believing. The Giants and Fairies that inhabit this area in Irish mythology make their Game of Thrones equivalents look more like Darby O'Gill and the little people. This area is one of the most naturally stunning of all the sites used in Northern Ireland. The rope bridge plays a major part in a series characters storyline. Although not compulsory, for those who wish to cross the bridge there is one requirement; courage! Much has happened in this limestone quarry: Brienne of Tarth defeated Ser Loras of the Flowers, Littlefinger seeks out Catelyn Stark who arrived to negotiate with King Renly,. Even Euron, Theon and Yara have made fleeting"appearances! 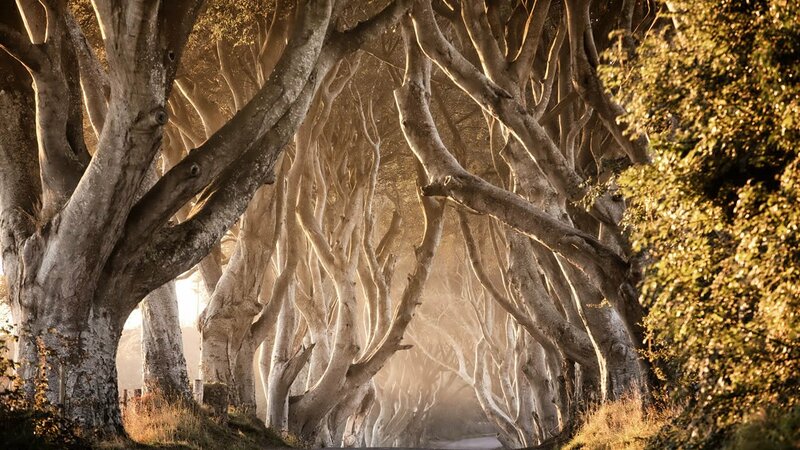 What a finale, the Dark Hedges! You may have escaped the scheming and duplicity of the capital! However, escaping by way of the "Kings Road" has its own dangers. Beware the "Grey Lady," for in reality, Melisandre has nothing on her! There is a lot of walking on what are sometimes uneven surfaces during this tour, and it therefore requires moderate fitness levels. Please come dressed appropriately for not only the season, but also for the activitiy. *Please note an upgrade to include crossing the rope bridge may be possible on the day of your tour, however, this is subject to numbers. This tour is independently operated. It is not sponsored, endorsed or affiliated with HBO or anyone associated with Game of Thrones.